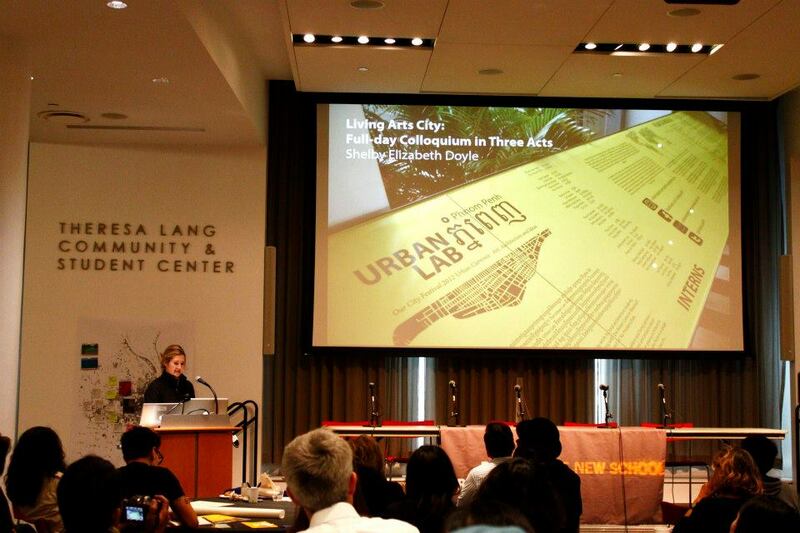 I’m presenting the Urban Lab and tomorrow. 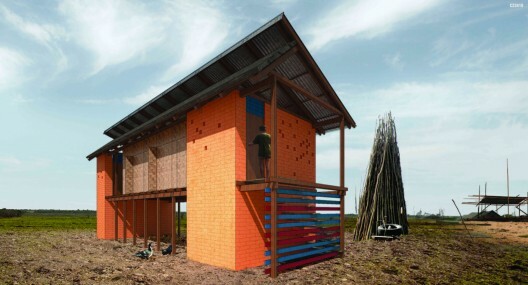 Presented in collaboration with IN RESIDENCE, the Visual Art program of Season of Cambodia. Scholars, researchers, students, arts organizers, artists, policymakers, urbanists and designers from both New York and Cambodia will participate in a series of workshops and dialogues focused on how creativity fuels cities and how development and commodification dampens art production. This will include conversations on the role of public art, festivals, cultural district formation, and the distribution of arts and of artists in cities and towns; and will address such issues such as design, media, ecology, and youth development. This three-act colloquium begins with Cambodian Visual Artists and Living Arts Fellows presenting themselves, their work and their ideas about art practice and organizations to colleagues in New York. Khvyay Samnang, Leang Seckon, Lim Sokchanlina, Pete Pin, Amy Lee Sanford, Svay Sareth, Than Sok, Tith Kanitha, Vandy Rattana, Vuth Lyno, Anida Yeou Ali. Rescue Archeology: Documents of Performance Art from Phnom Penh is a selection of videos of performance art by seven Cambodian contemporary artists, including: Khvay Samnang, Leang Seckon, Lim Sokchanlina, Amy Lee Sanford, Svay Sareth, Than, Sok, Tith Kanitha, and Anida Yoeu Ali. These works demonstrate that while extensive resources are invested in Cambodia to rescue the ancient cities associated with Angkor Wat, it is contemporary artists who seek to rescue the physical, psychological and personal memories of their present capital city, Phenom Penh. Our City Festival: Cultivating Communities takes a look at the role that festivals play in creating a dialogue about the arts and art production, with a specific focus on Our City Festival, an organization that since 2008 has hosted over 80 projects in 60 sites in Phnom Penh, involving over 500 artists, cultural activists, youth ambassadors, and community members. Khvay Samnang, Lim Sokchanlina and Vuth Lyno, co-founders of art collective Stiev Selepak, will present Phnom Penh’s historic White Building and the community-based experimental initiative Sa Sa Art Projects. Built in the 1960s, the White Building (originally known as Bassac Municipal Apartments) was one of the city’s first examples of low-cost, multi-story housing, and was specifically intended to house artists, cultural workers and municipal staff. Today, the White Building is one of the city’s most vibrant communities, hosting more than 2,500 residents, including classical dancers, master musicians, skilled craftspeople, cultural workers, civil servants, and street vendors. Located in the White Building and initiated by Stiev Selapak, Sa Sa Art Projects is an experimental space and residency program, creating opportunities for realizing new ideas. 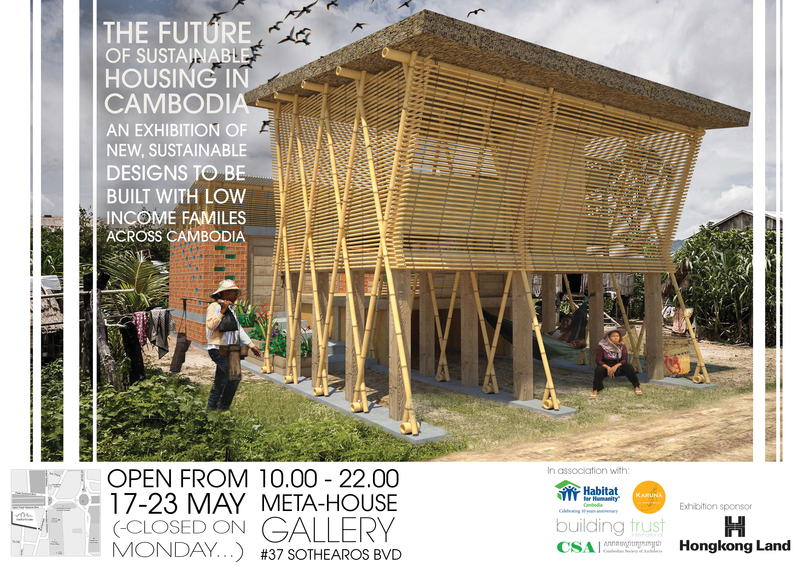 Sa Sa Art Projects also hosts occasional exhibitions designed by and for community residents, and offers regular classes in contemporary art to the residents and nearby students. 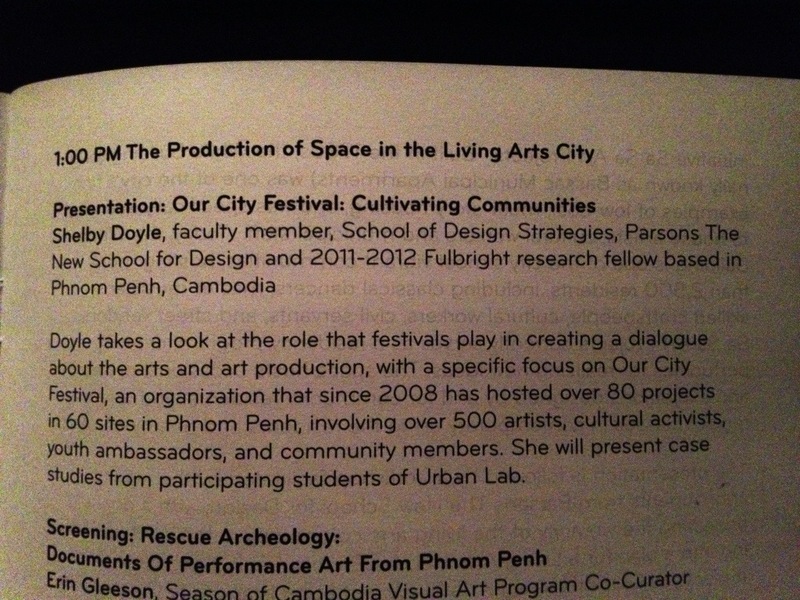 The presentation is followed by a workshop facilitated by the faculty and students from The New School, with a goal of projecting the vibrancy of the living arts community in the White Building into a plan for a Living Arts Hub for Phnom Penh. Such New York projects as East 4th Street Arts Block and Long Island City Civic Action provide a model for the discussion. An upcoming exhibition at Parsons about Phnom Penh, Cambodia – combining work from my Fulbright research, work by my students and by Parsons students. More soon. 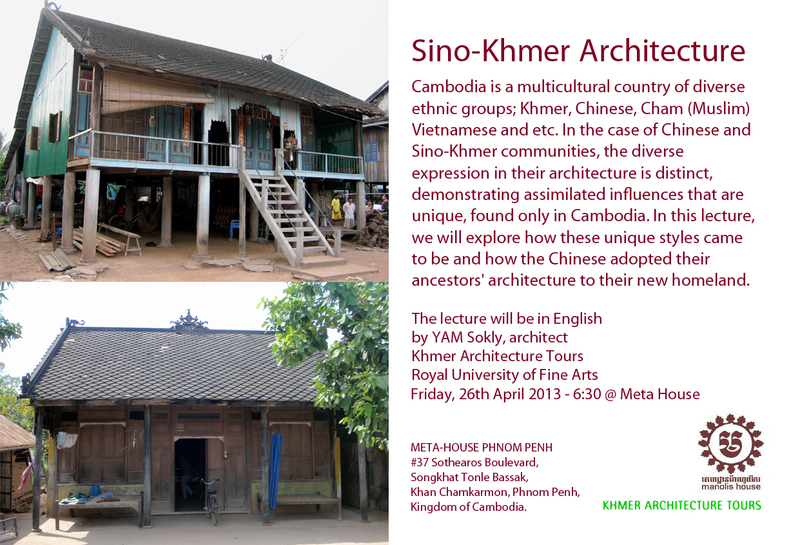 Water, Politics and Art offers an introduction to Phnom Penh, the capital city of Cambodia, as a Living Arts City. Phnom Penh is located at the confluence of the Mekong, Tonlé Sap, and Basaac Rivers, an intersection known as the ‘Four Faces’ or ‘Chaktomuk’. 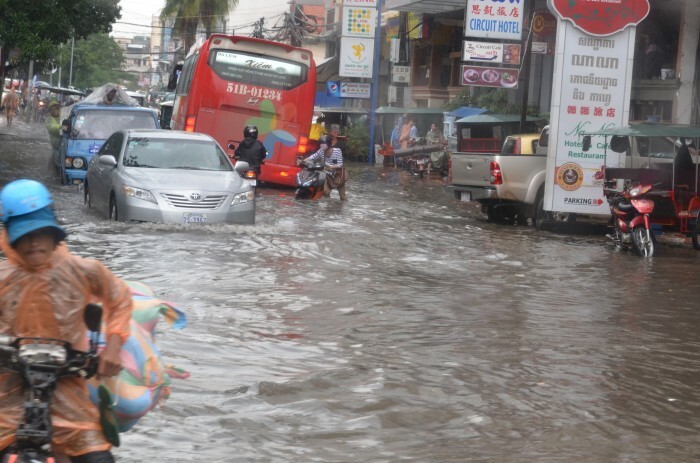 This fluid geography creates architectural and urban conditions both sustained by and subject to the cyclical floods of the city’s rivers, producing challenges for Phnom Penh as it rapidly urbanizes in a flood plain. After decades of civil war and unrest, economic and political stability have brought foreign investment and extensive change to the city and its landscape. However in the absence of access to data, documentation, political transparency or a locally supported strategic plan, heavy-handed development practices are directing a new type of urban transition for the residents of Phnom Penh. Students from Royal University of Fine Arts, Limkokwing University of Creative Technology, Cambodian Mekong University, Norton University and Pannasastra University of Cambodia as well as Parsons The New School for Design present work that describes the reality of this urban transition, as well as alternative strategies for the future of Phnom Penh. Shelby Doyle, a faculty member at Parsons who was a 2011-2012 Fulbright research fellow based in Phnom Penh, Cambodia, curates the exhibition. 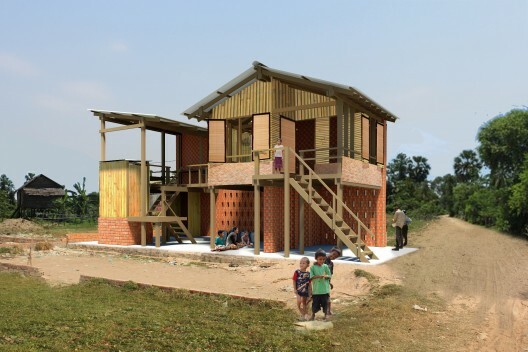 Her research is entitled City of Water: Architecture, Infrastructure, and the Floods of Phnom Penh. The exhibition is made possible through the support of Michele and Steve Pesner and Setpheap (Peace) San.